The first calendar (for Sophia) is finished and it really wasn't as much work as I thought and it was enormous fun too. But in order to reduce the workload I made a few clever decisions. I invested in plastic number and letter templates instead of creating templates myself which saved an enormous amount of time. I simply ironed bondaweb onto the wrong side of the fabric, placed the templates on the right sight, drew around it with a pen, cut them out with scissor and ironed them onto the 10 x 10 pre-cut fabric pieces. This part of the process took no more than 2 hours. I bought the templates on ebay and they are really good, come in a box and are of course reusable for ever. I then affixed the numbers and letters (again by machine) permanently with an appliqué blanket stitch. This took a little while of course but again not to bad and to be honest I wasn't going for perfection. The rest is straight forward. I basically made a quilt using a light grey as background so that the coloured and patterned pockets contrast well and therefore stand out. I quilted it in 1/2 in straight lines and bound it in a turquoise fabric that is also from the Cotton & Steele Noel collection. 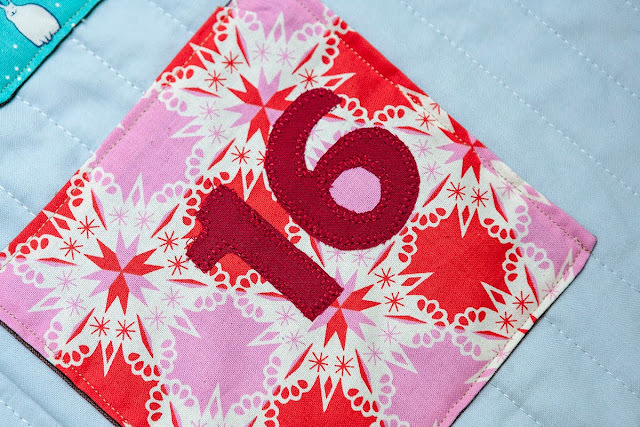 All pockets are lined to give them better structure and are attached to the quilt by machine. I sewed over the edges several times as I can imagine little hands grabbing them in a haste and I also think this quilt will be used as a quilt (not just a wall hanging) and toy a lot. 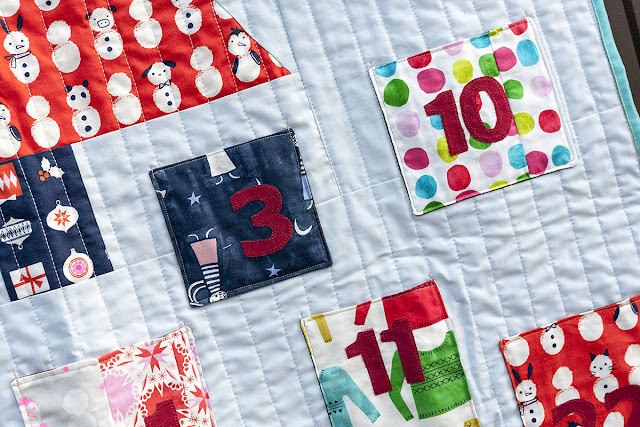 After all 3 year old kids really don't care to much if this is a Christmas quilt or not. Imagine all the things you can put into all these pockets over an entire year. I am already onto the quilt for Lily but am not sure if I finish it before my big trip to Japan. Let's see. First post on this here. Great quilt Judith! 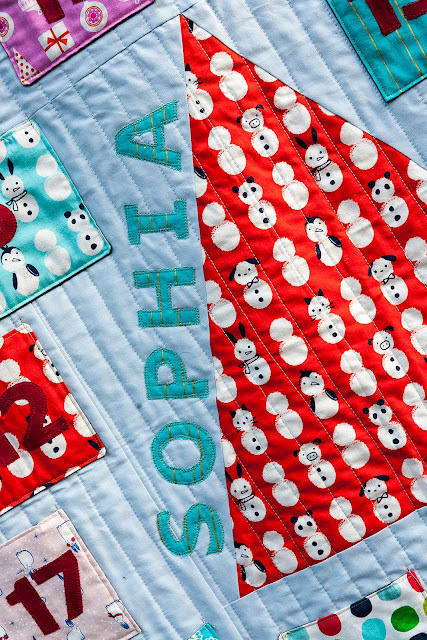 Such bright and happy colours, assured to be a hit with Sophia! Very lovely! I bet Sophia's mother won't let her use it as an everyday quilt though. 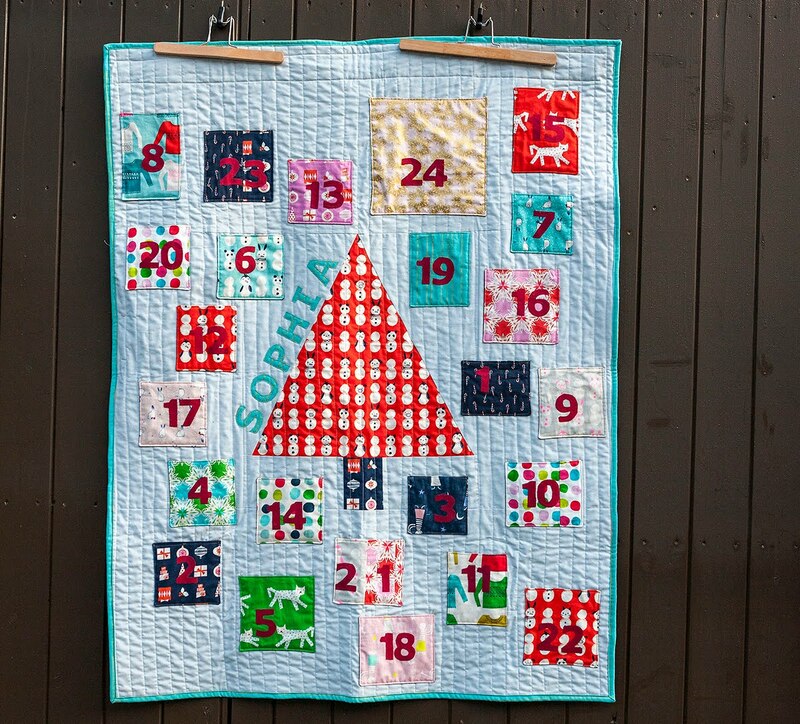 My daughter carefully puts the advent calendar I made for my GD away each year to wait for the next December.